I would be appreciate if anyone can solve problems below for this beam. ・Find the all sectional forces $F_x,F_y,M_x,M_z$ for both elements① and element②. ・Find elastic strain energy of element① and element②. Flexural rigidities of two elements are both $EI$ and torsional rigidities of them are $GJ$. 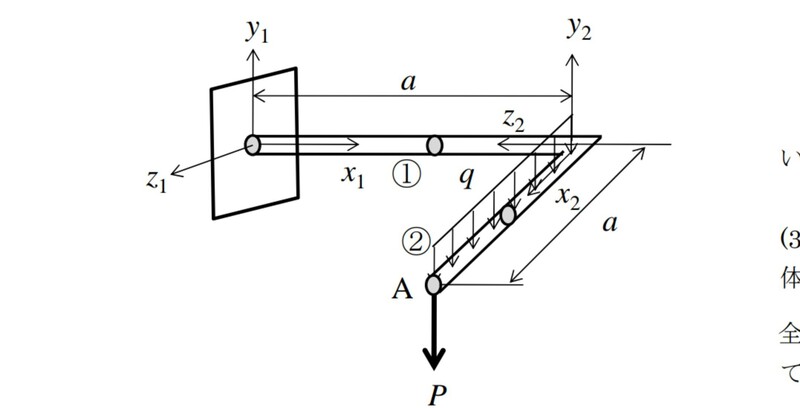 Lets start from the point A and name the other end of the beam B and the end at support, where element 1 is connected c, and radius of the beams, R.
Loads are P concentrated at A and q distributed between points A and B over L= a.
Elastic, strain, energy of beam AB , U is the work done by the forces which caused deflection. Note: all coordinate are assumed local WRT the beam. Not the answer you're looking for? Browse other questions tagged mechanical-engineering materials or ask your own question. How to analyse a frame of a machine?